Our complete range of steel replacement windows and doors, steel look screens and Heritage windows are specially designed to provide a replacement for old metal windows. We offer a range of casement windows, single or double doors with optional screens or the highly desirable ‘New York Style’ glazed screen and room divider. 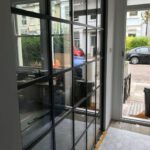 Steel Replacement Windows, Doors and Screens. Steel replacement windows and doors in aluminium, offer you similar sight lines to existing steel windows such as those found in many Surrey homes built in the 1920’s and later. We can replicate original vents such as stepped steel, slimline steel windows and the matching putty lines you find in bay and casement windows. We can even use our innovative aluminium Steel Look Window system to create fixed glazed screens in large or small sizes, with the multi-panel arrangement found in traditional metal screens, New York style screens and steel room dividers. For Doors, we provide super-slim single doors or double doors that re-create the panelled lock body found in old steel doors. We can create matching side panels, or toplights and include the run-through glazing bars typical of traditional metal windows. Replicate the appearance of old steel windows. Our Steel-Look or Heritage aluminium windows feature thermally insulated slimline aluminium frames, mullions and sash sections. They come with a choice of square or sloping glazing beads to recreate the desired window or door appearance. Using the advanced Smart Systems Alitherm 600, Alitherm Heritage and Alitherm 47 suite of aluminium, we offer you a comprehensive and modern aluminium window with all the appearance of traditional metal windows. Despite the traditional appearance of old metal windows, you benefit from all the advantages of modern double glazing. Multi-point locking to windows and doors. A choice of handles, including peg-stays or period hardware. Insulated aluminium, giving low U-Values. Top quality double glazed units. Our range of aluminium windows is available in virtually unlimited designs of either fixed, opening or traditional casement windows. Steel look windows come with a choice frame and vent profiles, standard or feature mullions and transoms, traditional weatherbars and extensive colour choice. We can provide your windows with a choice of horizontal and vertical glazing bars inside and out, for that authentic steel window appearance. Our steel look windows are also a fraction of the cost of steel windows. Create impressive and authentic steel look aluminium doors for the inside or outside of your home. Ideal for single doors, French Doors or combination screens, steel look doors feature traditional sightlines, ultra-slim door sections and a choice of horizontal or multi-panel glazing bars. Steel Look Screens and Room Dividers. Let us enhance the inside of your home with our Steel Look, New York Style glazed screens. These beautiful fixed frame screens feature the multi-panel design of old metal windows with a choice of transom and mullion thicknesses and selection of glazing bars. You can even incorporate single or double doors as well as opening windows. 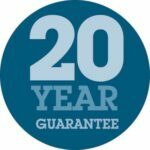 Steel Replacement Windows and Doors from Aspire Bifolds. 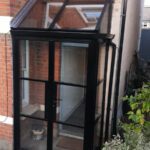 Visit our showroom today to see our range of steel look windows, doors and screens in traditional black powder-coated colours or choose from our extensive range of over 200 colours. Alternatively, contact us today for a free, no-obligation quotation or home survey. All our windows are suitable for residential or even commercial property, for new build or replacement window projects and retain the original appearance of your home. They are also perfect if you have a modern house and love the look of period metal windows.